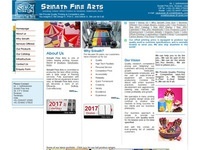 Srinath Fine Arts is one of India’s leading printing houses. Srinath Fine Arts is committed to producing the best offset printing, with a wide range of finishing services. Fully automated, with state-of-the-art equipment at each step, at Srinath Fine Arts every job becomes a work of art. Efficiently. Skillfully. Cost-effectively.